You can fit Origin Live arms to any deck but sometimes your armboard may need to be modified. The tonearms require a singe hole in the armboard or plinth – from 23mm up to 25mm in diameter (23mm is ideal for accurate fit). If your armboard needs to be replaced, please contact your dealer or manufacturer. Once the arm is inserted through this hole, secure it with a large nut under the armboard which clamps it in position. The armboard can be any thickness up to 25mm. You need not worry about VTA for Encounter arms and above as they have integral VTA adjustment. Arms below Encounter use VTA adjustment on the arm mounting thread itself so armboards need to be around 20mm or less to allow adjustment. The distance from centre of arm hole to centre of platter spindle needs to be 222mm plus or minus 1mm. The arms can rotate to be clamped at any angle. The effective length of the arm from its mounting hole center to the cartridge end of the arm is 240mm. The arm protrusion from pivot point to the rear is 50mm to the end of the counterweight stub. If the top of the armboard is around 24mm below the top of the platter then the arm will be at its lowest position for tracking a normal cartridge (17mm body height) and can be raised by a further 14mm. Centre of 23mm – 25mm diameter hole for arm mount to centre of platter spindle is 295.6mm plus or minus 1mm. The length of the arm from its mounting hole centre to the cartridge end of the arm is 309mm. The overhang from pivot point at rear end is 50mm to the end of the counterweight stub. Note – cartridge alignment is at best only ever a compromise. A cartridge is only aligned at 2 points on the record. For the remainder of positions on the record it is out of alignment. We say this to save fretting over the last 0.5mm accuracy and give a bit of perspective. Alignment makes an audible difference but in the scale of other parameters it’s really not a lot. If you modify your current armboard you will need to cut a hole in the board to locate the arm at the dimensions given above. This will leave you with the old hole looking unsightly. To hide this, make up a large circular plate washer of black card, aluminium or other material and glue this to the armboard. The spacing washers we supply with a new arm have an outside diameter of 48mm and will normally fulfil this function for most situations (the thickness of the washer is 1.5mm or 4mm). The advantage of gluing the washer to the armboard is that it also locates the arm in the correct position. Our arms are a drop in replacement for any vintage of Rega arm whether the later 3 point or older single hole mount. This means there are no worries about dimensions, heights, fitting hole sizes or anything else. This statement also applies to Rega Arm, OEM derivetives (Arms made by Rega but badged by another manufacturer). If you have a Linn LP12 turntable with a Linn arm then the arm hole on your current armboard will be in the wrong position (Linn arms mount at a distance of 211mm from the platter spindle). We can supply you with a pre-drilled armboard for the Origin Live and Rega arms at £27 (this board is identical to the Linn armboard but is missing the Linn Logo). Alternatively you can get a blank arm-board from Linn and get it drilled. This is simple to fit. On newer Linns the wooden corner brace has been increased in size which creates a slight foul with Standard size Origin Live and Rega arms. This is easy to rectify by removing a small semi-circle of the brace. Probably the quickest way to achieve this is to drill a series of 4mm holes as close as possible to one another in the shape of the cut out you need, then finish off the job with a chisel. The latest Linn LP12 decks do not allow for pre-drilled armboards to be fitted as the armboard is non-detatchable from the sub-chassis. In these cases we offer our arms with Linn geometry and base designed to perfectly fit all Linn decks. This makes a” Linn geometry” Origin Live arm a perfect drop in replacement on any Linn regardless of vintage. For non Linn decks which use Linn arm mount geometry, the “Linn geometry” Origin Live Arms are of course a drop in replacement. You can order the option for Origin Live arms with Linn geometry in the options offered on any tonearm ordering page. It’s a relatively small additional investment which will pay dividends in terms of convenience. 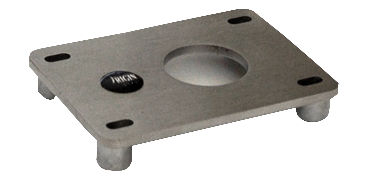 For decks with SME mountings we offer an SME adaptor plate which bolts precisely onto the vacated SME mounting holes. The adaptor plate has a hole positioned in exactly the right place so that you simply bolt the Origin Live arm through this hole. As the Technics deck is extremely popular we provide a special armboard which allows our arms to be fitted. If you have a Technics then this arm mount is offered in the options of all arm ordering pages.